Praline Bacon became a signature item on French Grocery's weekend breakfast menu, but it almost didn't happen. When I first suggested the dish to Kevin, he was skeptical. Kevin leans towards a more savory breakfast and wasn’t sold on the idea. Until we made the first batch. Sugar? On bacon? Yes, please! The salty, sweet, and smoky flavor of caramelized bacon is addictive and indulgent - a definite crowd pleaser and the perfect addition to any celebration breakfast. Or just your average Saturday. This isn't so much a recipe as a method. Quantities are listed for reference but use as much of each ingredient as needed to evenly cover each slice of bacon. Oven temperatures and times will vary, so plan to check on your bacon a few times through the second half of cooking. One caveat - if you can, plan ahead. Kevin says that laying the bacon out on the baking sheet can be done six hours or up to two days in advance and helps to dry out the surface of the meat for maximum sugar and pecan adherence. Personally, I just prefer having fewer steps in the morning between bacon cooking and bacon eating before I’ve finished my first cup of coffee. Either way, delicious! 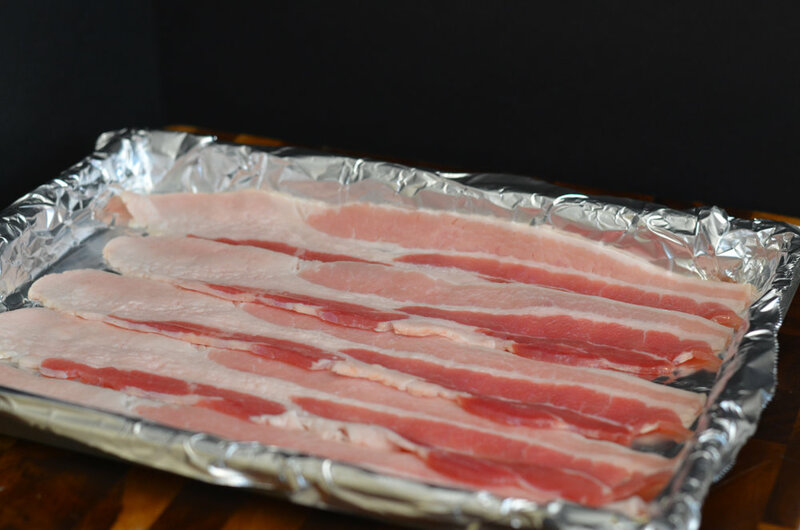 Lay the bacon out on a foil-lined baking sheet. Refrigerate uncovered for six hours, or up to two days in advance. Start the bacon in a cold oven and heat to 350°F. Bake for approximately 20 minutes, until the bacon begins to render some of its fat. While the bacon is cooking, toast the pecans in a dry skillet. You’ll know they’re done when they are warm to the touch and just beginning to give off their aroma. Remove from the heat and roughly chop. Remove the bacon from the oven and sprinkle liberally with brown sugar and pecans. Continue to bake until crisp, approximately 20 minutes. Check every five minutes during this time to prevent burning. Allow to cool before serving.